My current garter stitch, 'knit while I read' project is another Hitchhiker shawl. I thought I'd talked about it already, but I was unable to find a previous post, so maybe not. 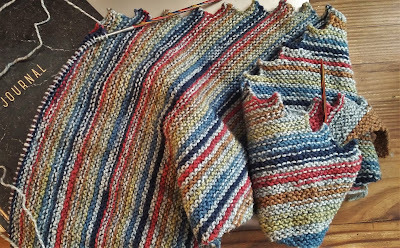 I'm knitting the shawl with Patons Kroy Socks in the Blue Striped Ragg colorway and using a US 4 needle. I was worried about how the self striping yarn would behave but so far, I'm very happy with it. Very happy with it, except that I've knit 30 teeth already and it seems to be growing in width much faster than in length. But as they say, I'm sure that sh*t will block right out. It's interesting the way self-striping sock yarn works in other projects. I really like those thin stripes in your shawl. I was afraid it would start pooling but so far, so good. I love the edging on this pattern, I'll be adding it to my list. Triangular shawls are such a nice shape to wear, they always sit really nicely on your body. "I'm sure that sh*t will block right out" — this made me laugh! Oh my! It is gorgeous!